The 88 sq. km Caribbean island of Saint Martin/Sint Maarten has been divided between France and the Netherlands since the Treaty of Concordia in 1648. The boundary shifted more than a dozen times between 1648 and 1816 between several different colonial powers before settling into its current alignment, which gives French Saint Martin the northern 62% of the island and Dutch Sint Maarten the southern 38%. Saint Martin is an outermost region of the European Union but, Sint Maarten is not an EU territory; nevertheless, the border is open and largely invisible on the ground. 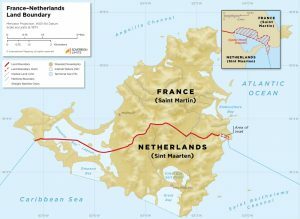 Recent efforts by the French and Dutch governments to agree to a precise delimitation of the 15 km land boundary have been hindered by a dispute concerning the alignment of the line in the vicinity of Oyster Pond on the east coast.